Visas on arrival are only available for travelers flying into the country and your nationality may be exempt - check our FAQ. Vietnamese immigration will stamp your passport once you have handed over your visa approval letter, 2 passport pictures, and the Government stamping fee. The stamping fee is $25 for single entry visas, $50 for multiple entry visas and $135 for one year visas. 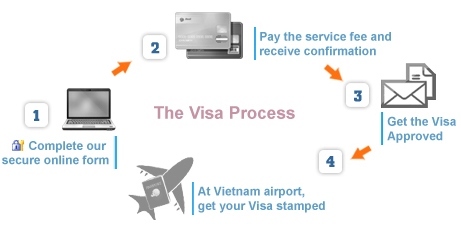 Vietnam Visa Choice was one of the first companies to offer “visa on arrival” services for Vietnam. Visa on arrival services are legitimate and recommended by Lonely Planet travel guide. Our customers expect a no nonsense, secure, fast and trustworthy service and this is what we provide. We have fantastic staff and guarantee our service. Our relationship with Gate 2 Shop payment gateway, ensures your transaction is fully secure and protected. Let us handle your visa for you with the minimum of fuss, leaving you time to plan your holiday. We look forward to your application.